Casey Mulligan has an interesting post on the effect of a more generous safety net on propensity to work. The key intuition lies in the difference between two graphics. 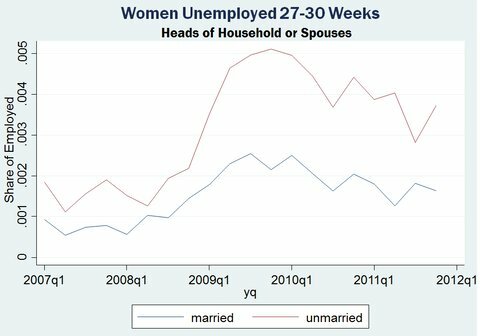 First, the share of unemployed who are married women versus unmarried women at the start of an unemployment spell. Second, those same shares at around 7 months into an unemployment spell. A married woman (and her family) with a husband earning above the poverty line – the vast majority of husbands do so – is ineligible for a number of safety-net programs regardless of whether she’s employed, because her family’s income is above the poverty line regardless of her employment status. Unmarried household heads, on the other hand, are usually the sole breadwinner for the family, and when their income falls to zero, the household income essentially does, too. 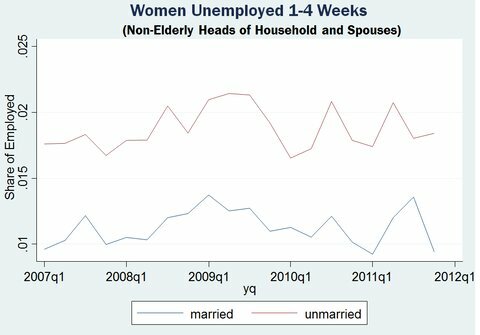 For this reason, more unmarried women who are heads of households can expect anti-poverty programs to help them when they are out of work than married women can. In other words, anti-poverty programs provide significantly more cushion for unmarried women than they do for married women.